From early in the history of Christianity in the British Isles and Ireland, links have existed between churches of western British regions, especially Wales and Cornwall, and Brittany. Migrations from Ireland and western Britain to Brittany brought manuscripts to communities of monks and nuns there, where their styles influenced Breton book decoration, and manuscripts travelled the other direction, from Brittany to Wales and Cornwall. Even after Charlemagne's programme of book production and monastic standardisation, Breton manuscripts retained their decorative style. In a manuscript such as this gospelbook, animal ornament, interlace and other designs resembling British and Irish decoration, coexist with a handwriting style (script) developed at Tours and earlier Continental decoration. The gospelbook opens with St Jerome's letter to Pope Damasus in which he tells about the new latin gospels he has edited. St Jerome's letter, referred to as the 'Novum Opus' after its first words, was one of several standard 'prefaces' placed before the gospel text in early medieval manuscripts. This manuscript's decoration is modest in comparison with the most famous Irish manuscripts, such as the Book of Kells, but the interlace designs and simplified animal heads share their decorative traditions. 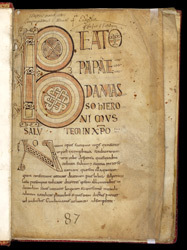 The face in the letter O of 'Beato' belongs to early medieval European manuscript decoration in general.